Home › Allergy & Sinus › Is Isoquercetin the cure for allergies? Quercetin is a naturally-occurring flavonol, found in fruits, vegetables, grains, and leaves, that has long been considered the premier natural anti-histamine for those who struggle with seasonal allergies. I wrote an article that explained how allergic reactions occur and I highlighted quercetin’s ability to keep histamine from being released into cells (which causes allergy symptoms). Quercetin remains a top-notch natural solution to a running nose, itchy eyes and inflamed sinuses, but now there may be something even better – isoquercetin. Isoquercetin, and the very similar isoquercitrin, is a kind of quercetin that is the most common form found in nature. These quercetin forms are commonly found in capers, onions, yellow peppers, or apple peels. Manufacturers are just starting to make isoquercetin supplements available, and it’s no wonder because research indicates that these quercetin glucosides (isoquercetin & isoquercitrin) may be much more effective than quercetin by itself. Studies, published in journals such as The American Society for Nutritional Sciences, have shown the glucoside form is a better-absorbed form of quercetin. Integrative Therapeutics now has a product called Alpha-Glycosyl Isoquercitrin that utilizes isoquercetrin. Integrative Therapeutics’ research, as well as independent studies from journals such as Biological and Pharmaceutical Bulletin, found that isoquercitrin in this particular formulation was three times more bioavailable than isoquercetin (found in many similar products), and almost 18 times more bioavailable than standard quercetin. Of course, getting quercetin through the foods we eat is ideal but, in this case, not practical. Capers, which are naturally high in quercetin, only have about 15mg per teaspoon. Likewise, onions (which are also high in natural quercetin) lose a third of their quercetin when cooked and also begin losing their quercetin after just 10 days out of the ground. Most supplements come with over 250mg of quercetin and are suggested to take twice daily for a therapeutic effect on controlling allergies – which would require over a half cup of capers, 9 small raw, recently-harvested onions, or the peels from a half a bushel of apples – twice a day! Supplementation, with its purity and controlled dosages, is a practical and effective way to increase quercetin levels for the allergy season. Since everyone responds differently to various substances, it’s impossible to say which quercetin supplement will be most effective for your allergies. If you find that the one I previously recommended (Quercetin-Bromelain Complex by Douglas Laboratories) works for you, then stick with it. However, if you have tried other quercetin products and have been disappointed, that Alpha-Glycosyl Isoquercitrin may give you great results. But remember that if you have been taking 500mg of quercetin, ask your health care professional about revising your regimen at a ratio of 1:5, which would be about 100mg of isoquercetin. For the allergy season this year, I encourage you to revisit my article on allergies, and consider the improved iso forms of quercetin. I hope this information is useful to you, and if you have any questions regarding the concepts discussed here or anything else, you can reach our customer service team at 888-460-3091 or e-mail them at customerservice@oakwaynaturals.com. Alpha-Glycosyl Isoquercitrinan Integrative Therapeutics exclusive delivers all the benefits of quercetin with better absorption and improved bioavailability. Alpha-Glycosyl Isoquercitrin has 3 times the bioavailability of isoquercetin and nearly 18 times the bioavailability of quercetin aglycone. Because it is actively and rapidly absorbed, Alpha-Glycosyl Isoquercitrin reaches peak plasma levels in 15 minutes! Quercetin is a naturally-occurring flavonol, found in fruits, vegetables, grains, and leaves, that has long been considered the premier natural anti-histamine for those who struggle with seasonal allergies. The article “Natural Solutions to Seasonal Allergies” explains how allergic reactions occur and highlights quercetin’s ability to keep histamine from being released into cells (which causes allergy symptoms). Quercetin remains a top-notch natural solution to a running nose, itchy eyes and inflamed sinuses, but now there may be something even better – isoquercetin. Isoquercetin, and the very similar isoquercitrin, is a kind of quercetin that is the most common form found in nature. These quercetin forms are commonly found in capers, onions, yellow peppers, or apple peels. Manufacturers are just starting to make isoquercetin supplements available, and it’s no wonder because research indicates that these quercetin glucosides (isoquercetin & isoquercitrin) may be much more effective than quercetin by itself. Studies, published in journals such as The American Society for Nutritional Sciences, have shown the glucoside form is a better-absorbed form of quercetin. Some quercetin and isoquercetin products combine the active ingredient with particular black pepper extracts or bromelain to further increase absorption. 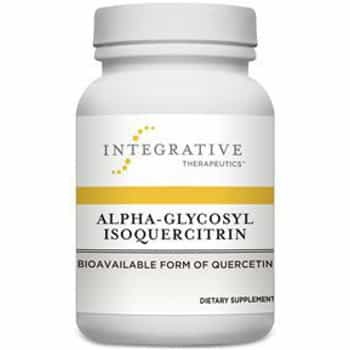 One new product to be aware of is Alpha-Glycosyl Isoquercitrin by Integrative Therapeutics. This one uses isoquercetrin and is formulated to increase absorption. Integrative Therapeutics’ research, as well as independent studies from journals such as Biological and Pharmaceutical Bulletin, find that isoquercitrin in this particular formulation was three times more bioavailable than isoquercetin and almost 18 times more bioavailable than standard quercetin. Since everyone responds differently to various substances, it’s impossible to say which quercetin supplement will be most effective for your allergies. If you find that the one I previously recommended (Quercetin-Bromelain Complex by Douglas Laboratories) works for you, then stick with it. However, if you have tried other quercetin products and have been disappointed, the new Integrative Therapeutics’ Alpha-Glycosyl Isoquercitrin may give you great results.